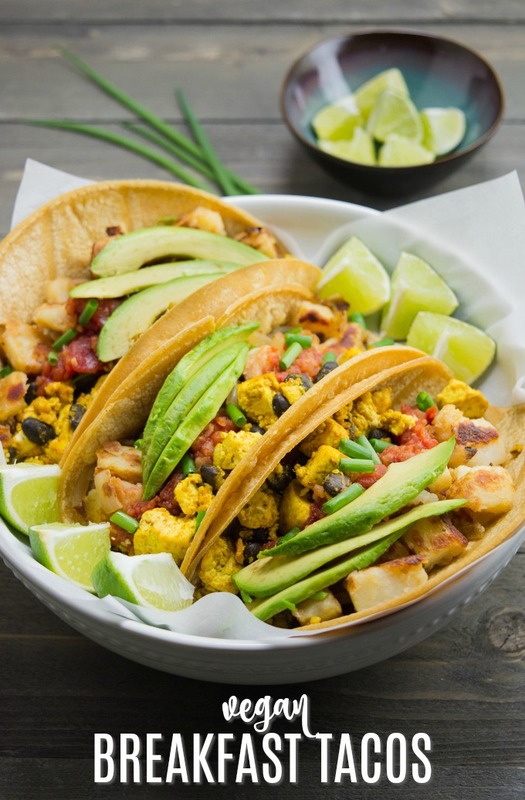 Vegan Breakfast Tacos are filled with seasoned tofu scramble and crispy potatoes, then topped with salsa, avocado slices, and fresh green onions. 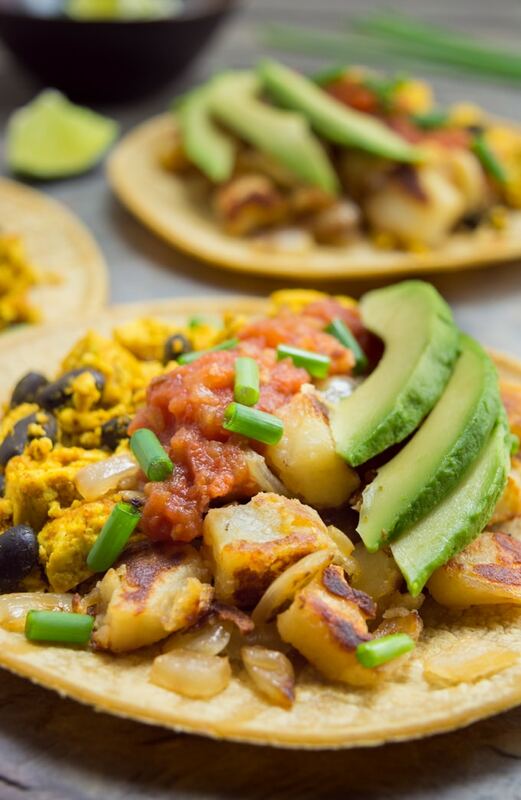 It all comes together in a corn tortilla for the most irresistible breakfast taco you’ll ever wake up to! Serve these savory tacos with a tall glass of orange juice— or, a mimosa or two! If you keep up with the blog you know my family and I are huge fans of ‘Mexican-inspired’ vegan food. I’m always looking for new ways to turn a meal into a ‘Fiesta’ and recently breakfast is no exception. Don’t get me wrong, I love the morning classics like pancakes, waffles or even a loaf of sweet banana bread. But sometimes I want more! 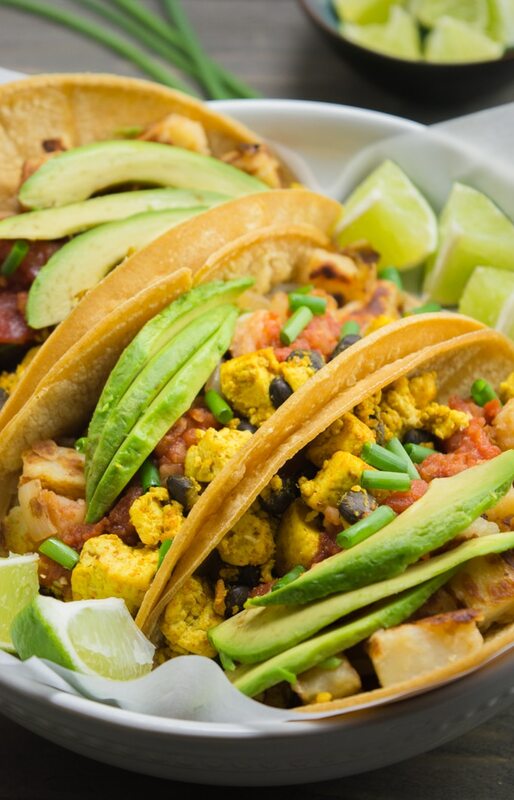 Bring in these savory breakfast tacos and now we’re talking! 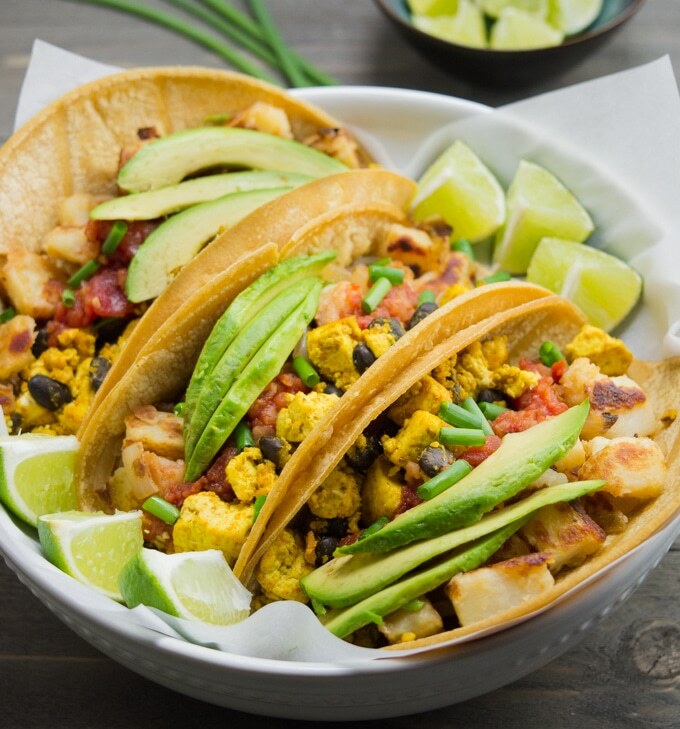 Perfectly seasoned tofu scramble and black beans give these breakfast tacos a hearty serving of morning protein. Potatoes are sautéed with fresh onions and bell peppers for a bold Southwest taste. Now stuff all that goodness into a corn tortilla and add your favorite toppings! These will quickly become your new weekend breakfast obsession! Breakfast potatoes can be prepared a few different ways. Choose the one that works best for you! The first method uses my Instant-Pot Breakfast Potato recipe. It’s a make-ahead recipe and usually my go-to for these tacos. The potatoes are prepared and seasoned in the Instant-Pot then chilled overnight. 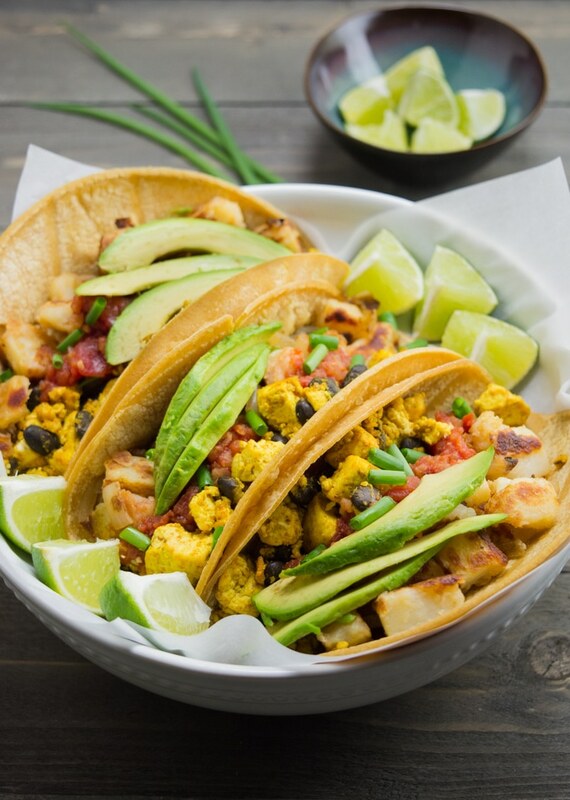 They come together quickly the next morning— or whenever you’re ready to make vegan breakfast tacos! The second way is another ‘make-ahead recipe’ using baked potatoes. This method is perfect if you have leftover baked potatoes, or you don’t own an Instant-Pot. Bake the potatoes the day before and chill them overnight. The next morning, sauté onions and bell peppers along with the potatoes and seasonings. The third way uses oven roasted potatoes. In this method the potatoes are prepped and cooked the same day. Peel and dice the potatoes, toss them with oil and seasonings, then bake them in the oven. Lastly, you may use frozen breakfast potatoes. They are great for a quick option. Cook them according to the directions on the package. Simple, gluten-free tacos are made with healthy ingredients and quickly come together. Top these Mexican-inspired breakfast tacos with salsa or hot sauce for the adults. 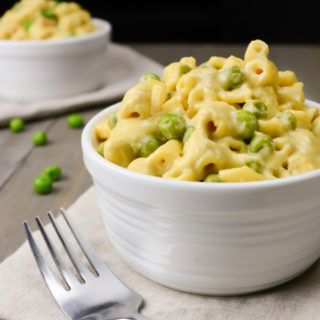 Add ketchup for the kids and picky eaters. Or keep the them fresh with a generous squeeze of lime juice. Garnish with avocado, green onions, sliced jalapeños, fresh cilantro, sweet corn or anything else you have on hand! The topping possibilities are endless! 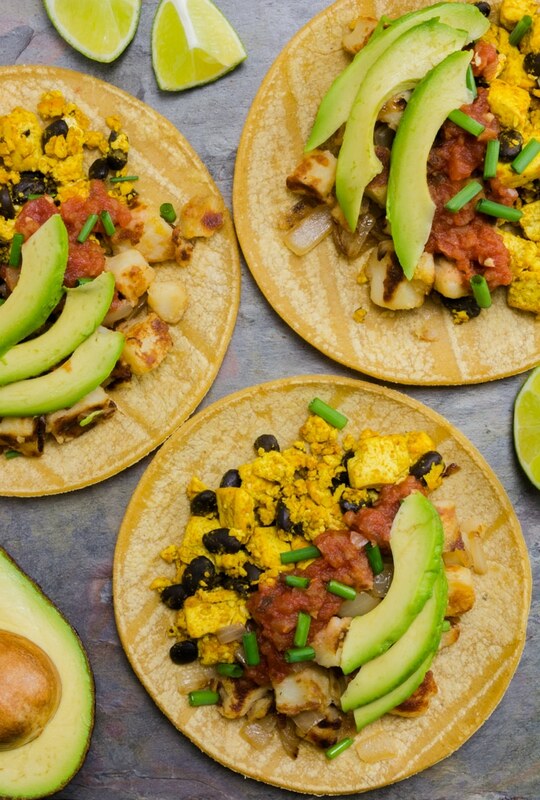 Satisfy that morning hunger with these protein-packed tacos. They’re a perfect start to your day! 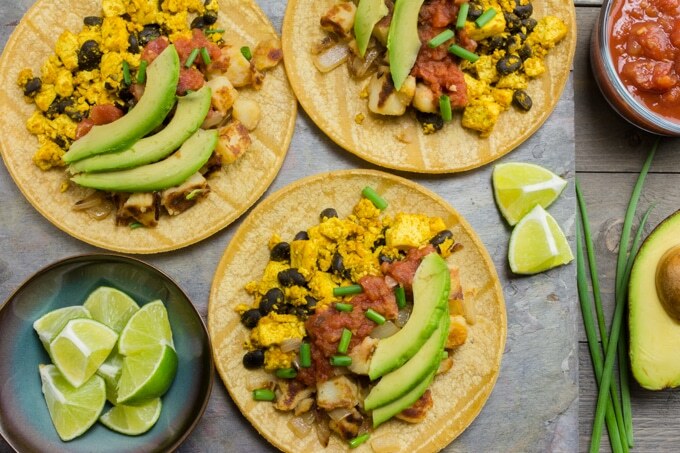 Vegan Breakfast Tacos are filled with seasoned tofu scramble and crispy potatoes, then topped with salsa, avocado slices, and fresh green onions. For the perfect breakfast/brunch, serve these savory tacos with a tall glass of orange juice— or, a mimosa or two! Press and dry the tofu to remove as much moisture as possible. Add the oil and tofu to a saucepan. Heat over medium heat for 3-5 minutes. Mix in the seasonings and cook for another 8-12 minutes, then add the beans. 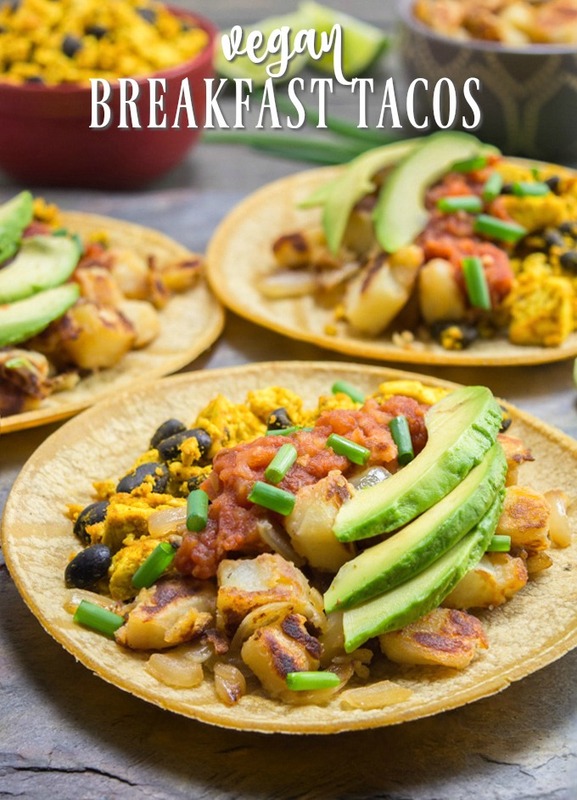 Instant-Pot Breakfast Potatoes are my favorite potatoes for these tacos. They do need to be chilled overnight, but come together quickly the next morning. If you don’t own an Instant-Pot, just use one of my baking methods below. Bake 3-4 russet potatoes at 400ºF for 40 minutes or until slightly softened. The potatoes don’t have to fully bake since you will be pan cooking them. After baking, allow the potatoes to chill in the refrigerate until the next morning. The next morning, Peel and chop the potatoes. Set aside. Add the bell pepper to your pan with a few teaspoons of oil. Sauté for 3-5 minutes or until they begin to change color. Add in the onion and sauté another 5-10 minutes or until veggies are cooked. Remove the veggies from the pan. Add in the dice the potatoes, seasonings and a few tablespoons of oil. Sauté until browned and crispy. Mix the veggies in with the potatoes. Peel and dice the potatoes into bite sized cubes. Use a kitchen towel or paper towel to dry the cut potatoes. 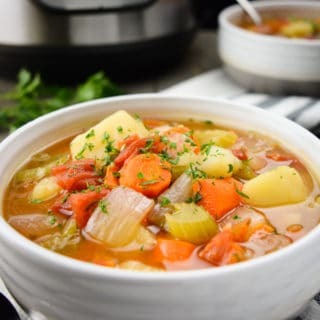 In a large bowl combine 2-3 Tablespoons melted oil, potatoes and seasonings. 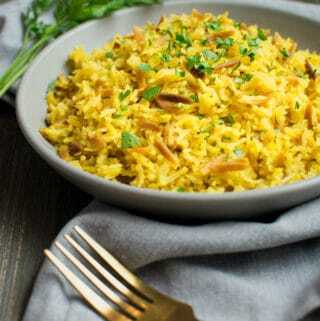 Spread on a baking sheet and bake for 40-50 minutes or until the potatoes are golden brown. You may need to flip the potatoes half way through to evenly brown them. While the potatoes are cooking, add the bell pepper to a pan with a few teaspoons of oil. Sauté for 3-5 minutes or until they begin to change color. Add in the onion and sauté another 5-10 minutes or until veggies are cooked. When the potatoes are done add the veggies to the baking sheet and toss everything together. Place it back in the oven for a few minutes to reheat the veggies. Place a scoop full of tofu mix and a scoop full of potatoes on the tortilla. Add your favorite toppings and devour. *Prepackaged potatoes are a good substitute for quick, last minute tacos. *Generously season the potatoes. I usually don't measure the seasonings when I'm using one of the above methods. For a guide on measurements I suggest checking out my breakfast potatoes recipe. *Canned black beans usually yield 1 and 1/2 cups. I like to divide the rinsed beans into 3 portions. I use one portion for the tofu and freeze the other 2 for tacos later. Otherwise, the tofu recipe can be doubled and the whole can may be used. yum! i always forget about breakfast tacos, but they are freakin' delicious! Aren't they?! Definitely one of my favorites too!